Coming from Stoke on Trent comes with a few curses, especially when you’re from ‘these parts’… A lot of people round here don’t have one of those fancy things called a Passport (don’t judge!) so Luxury Holidays are one of those things which we generally dunna do duck, cost we canna afford like. One of the only reasons I’d want to travel though, isn’t for the sun, the beaches or even the architecture, the main reason is for the FOOD. I don’t know if you’ve noticed, but I’m quite partial to it and the fancier, the more flamboyant, the better. Food is one of my favourite things in the world and it makes me happy every day that (apart from Stoke) you can taste the world without leaving the UK! I mean really, why is Stoke on Trent so awful for independent and exciting food? Anyway. Inspired by my foodie based Wanderlust, here’s my countdown of the Top UK 5 Restaurants I want to visit before I DIE (or before the end of the month/year…. either/or). Don’t worry, they’re not too fancy or exciting, I like to aim for the realistic side of the plate, but if you’ve ever been to any let me know! If there’s one thing I like almost as much as food, it’s quirky artwork. Ever since I saw David Shrigley had transformed the gallery room in sketch I knew that one day I needed to go! When that day will be, I’m not sure, but I’m hoping it will be very soon. It’s not an exotic place to eat, but does have a range of afternoon teas, comforting classics and quirky takes on a lá carte dishes for everyone to enjoy. Oh and have you seen the toilets? THEY’RE EGGS! 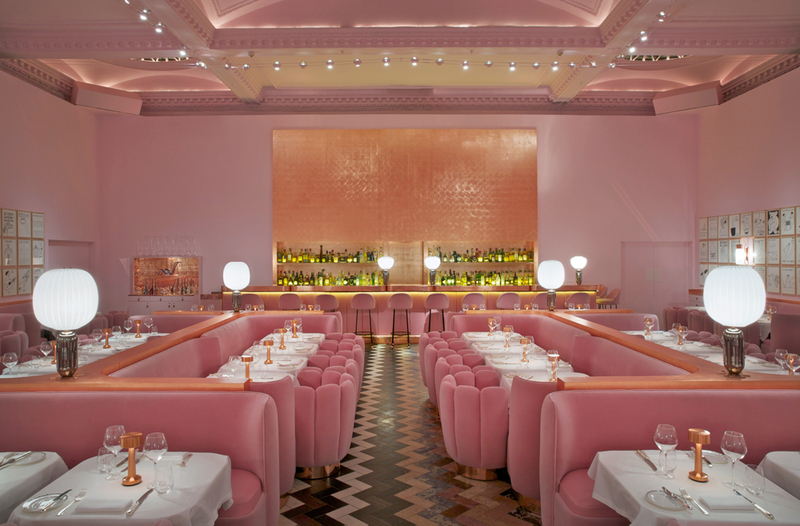 Not to mention that pink room of joy… I just need to see it in real life. One day, one day. The ‘Sunday Gospel Brunch’ from Alma De Cuba looks like the perfect way to taste the eclectic flavours this Cuban based restaurant and bar have to offer. Dishes which stand out for me are the ‘Full Cuban Breakfast’, because you simply can’t go wrong with maple glazed bacon, and the In House Jerk Chicken which is served with coconut rice and scallion gravy. Mmmm…. I’ve tried to go to Turtle Bay in Manchester about 4 times now, only to find it’s too busy and heading somewhere else instead, booo! This can only be a good thing though, as it means the food and drink must be excellent to be heaving so much, so often! The menu consists of Caribbean inspired dishes, including a Goat Burger, Double Dipped Steak and Mo’ Bay Chicken *drooool* One day I’ll actually book in and go, but for now I’ll dream of such spicy, tropical tastes by living vicariously through reading the menu online *sob* Although I have just found on the website that they do take away, so that’s a small victory in itself I guess. Pecks is a local place which all the Cheshire set tend to dine in. It’s literally just down the road from me and once Harry Styles went. Harry Styles doesn’t even live round here any more, so I’m a little disgruntled he’s been and I haven’t yet! This has been on my hit list of foodie eats for years now and one day I’ll get the chance to go. I hope. I mean, you have to go to a ‘Theatre of Food’ once in your life, right? Pecks do a ‘Dinner at Eight’ menu, where guests are sat down to a 5 course meal starting at 8pm. You get samples of each dish from the menu and the staff describe each dish before you choose, meaning you just can’t go wrong! Not only is Fu Manchu the name of a Stoner Rock band from the 80’s, but it’s also the name of this rather fancy looking Dim Sum place in London. The small portions but big flavour makes Dim Sum a lovely option to mix with cocktails, and that’s why Fu Manchu is one culinary adventure I want to be part of. Soon. Not to mention it’s something a little bit different from Afternoon Teas and Burgers which I usually go for! Okay, so this ‘Top 5’ should probably be a monthly thing, because these 5 are just for starters!! There’s so many places I want to eat at and experience. Where would you recommend? Have you been to any of the above places?? Let me know your #ElegantExperience in the form of food!